1. In a certain store, the profit is 320% of the cost. If the cost increases by 25% but the selling price remains constant, approximately what percentage of the selling price is the profit? 3. A merchant sells his two cars – one at 15% loss and another at 12% profit. If the cost prices of the two cars are in the ratio of 1:2, what is his percent profit or loss? 1st SP = 100-15% of 100 = Rs.86. 2nd SP = 200 + 12% of 200 = Rs.224. Total CP = Rs.300. Total SP = 85+224 = Rs.309. Profit = Rs.309-300 = Rs.9. Profit percent = 9x100/300 = 3% profit. 4.The cost price of 16 articles is the same as the selling price of 12 articles. Find the loss/profit percentages. Note: The gain is 4 out of 12 articles. Therefore, gain percentage = 4x100 /12 = 100/3%. 5.Raju purchased an item for Rs.4,500 and sold it at the gain of 15%. From that amount he purchased another item and sold it at the loss of 10%. What is his overall gain/loss? Overall gain = Rs.4657.50 – 4500 = Rs.157.50. 6.Mohan purchased 15 kgs of rice at the rate of Rs.26 per kg and 8 kgs of pulses at the rate of Rs.26 per kg. Wheat is the total amount that he paid to the shopkeeper? Therefore, Total amount = Rs.390+Rs.208 = Rs.598. 8. 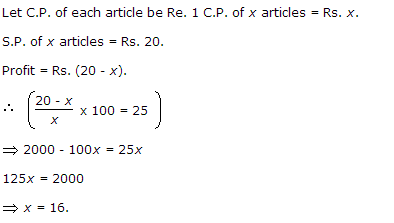 The percentage profit earned by selling an article for Rs. 1920 is equal to the percentage loss incurred by selling the same article for Rs. 1280. At what price should the article be sold to make 25% profit? 9.A man buys a cycle for Rs. 1400 and sells it at a loss of 15%. What is the selling price of the cycle?